Rumparooz cloth diapers are part of the Kanga Care line of cloth diapers and accessories. Rumparooz are specially designed to prevent leaks and come in several cute prints and colors. These one size pocket diapers feature a double inner gusset, which is unique to the Kanga Care brand. There is a choice of snap or hook and loop closures, and the diapers come in several cute prints as well as solid colors. Rumparooz are popular with many parents, who say they are particularly good at containing poop, including the loose stools of exclusively breast fed babies. The inner layer is extremely soft, and the diaper comes with two inserts. While many parents absolutely love this diaper, a few have difficulty with the fit. 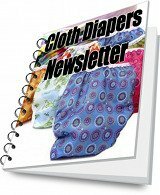 Because the diapers are on the pricey end (they cost approximately $24 per pair), I would suggest buying one or two to ensure they are a good fit before you commit to buying a whole stash of Rumparooz. Lil Joey All in One Cloth Diapers are AIO cloth diapers designed to fit preemies and newborns from four to twelve pounds. Because they are designed specifically for newborns, they have a snap down front to avoid irritation of baby's sensitive umbilical cord area. Lil Joey diapers feature the same double gusset that is unique to diapers in the Kanga Care line of products, a four layer microfiber absorbent layer and snap closures. The 6R Soaker is available in microfiber or bamboo. 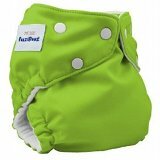 They are designed to be used with Rumparooz pocket diapers or other pocket diapers. Do note, that because microfiber is super-absorbent, it should not be used directly against baby's skin because it can cause irritation and dryness. Therefore, the microfiber inserts are suitable for use with pocket diapers, but they should not be used as a lay-in diaper doubler. These inserts come in a pack of two (a newborn insert and a one size insert), which can be used separately or together. The newborn insert is smaller and contoured at the sides to fit a newborn, and the one size insert is longer, but can be snapped down for a smaller fit. Kanga Care Diaper Liners are handy to have around for those times when you need to use diaper rash cream. Diaper rash creams should not come in contact with the inner, absorbent layer of cloth diapers because they can reduce the absorbency of the diaper. A washable diaper liner provides the barrier needed to avoid getting diaper rash cream on your cloth diapers. Kanga Care Wet Bags come in the same cute colors and prints as you'll find in Rumparooz and Lil Joey diapers. They are waterproof and have a zipper closure. These wet bags hold about 15 diapers and inserts, which is perfect if you are washing your cloth diapers every couple of days. The wet bag can take the place of a diaper pail. The Kanga Care Diaper Pail Liner is barrel shaped (rather than flat), which allows it to hold more diapers. It comes in several cute colors and prints, and the outer fabric is cuffed at the top of the liner so the color or print of the liner shows when it is folded over the top of your diaper pail (no ugly bags ruining the decor of your baby's nursery!). The drawstring has a toggle closure, which allows the diaper pail liner to fit neatly in a variety of diaper pails, and the fabric is laminated on the inside, so moisture from the diapers does not seep into the fabric. The Kanga Care Changing Pad measures 24 by 15 inches. The colors will match other Kanga Care accessories or Rumparooz or Lil Joey diapers you may already have, and this changing pad can be purchased for approximately $15.